Frigidaire 240337103 Crisper Pan for Refrigerator. Works with the following models: Frigidaire BLRT86TEB9, Frigidaire BLRT86TEBA. Part number 240337901. Kenmore refrigerator (model # 25374813408). Kenmore 253.68892010. - Refrigerator crisper drawer 240337103 is an original equipment manufacturer (OEM) part that fits some Kenmore 253-series top-freezer refrigerators, as well as some Frigidaire, Gibson and Crosley top-freezer refrigerators. - Replaces part numbers 240337107, 240337108 and 240337109. 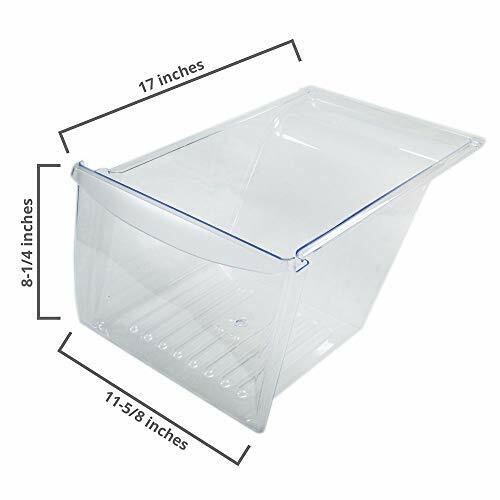 - Crisper drawer 240337103 stores fruits and vegetables at a humidity level that helps keep them fresh longer. - The drawer is 11-5/8 inches by 17 inches by 8-1/4 inches.